Turning classic American favorites into healthy versions that actually taste incredible is at the top of the list for us. It’s about finding new ways to dress up an ordinary dish in order to experience variety and feel like you’re cheating when you’re not. Creamed spinach does just that. If spinach is one of your favorites, but you’re getting tired of eating it the same old way… this recipe is a must try! One serving equals one cup cooked vegetable and 1 serving of fat. Heat oil or butter in a large pan over medium heat. Add onions, cooking until tender, then add garlic, sautéing 1-2 minutes more. Add spinach and sauté until wilted. Season with sea salt, pepper and optional crushed red pepper and nutmeg. Reduce heat and add the coconut milk, simmering 1-2 minutes or until heated. 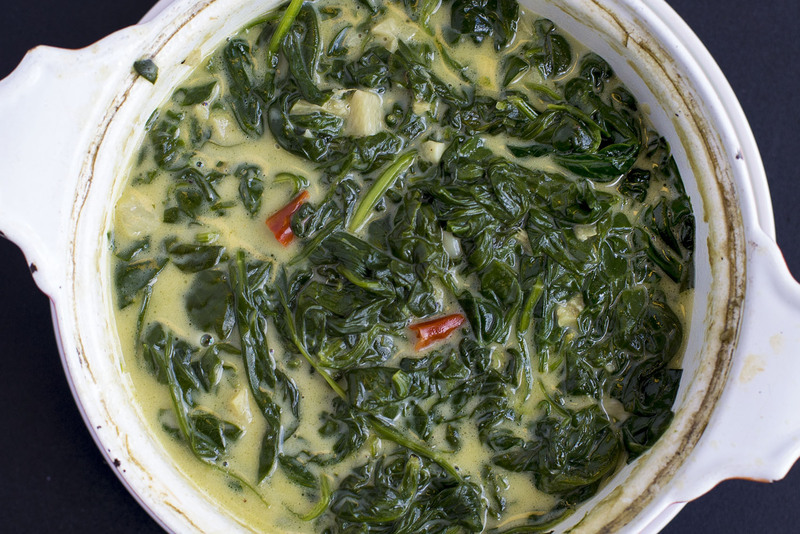 NOTE: You can always add more spinach or coconut milk to create the consistency you desire. If you are on maintenance: Add parmesan cheese, to taste, as a flavor boost or thickener.